Biokovo Cranesbill is a hardy geranium perennial plant and not to be confused with the geranium species that is typically grown as an annual. The Biokovo is a hybrid cross of the Geranium dalmaticum and the Geranium macrorrhizum found in the Biokovo Mountains in Croatia. 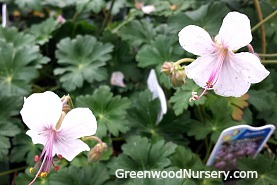 In spring, clusters of white flowers with pink shading cover the Biokovo Geranium and are striking against the medium green fragrant foliage. The medium green foliage changes to scarlet to orange during fall. Plant in well drained soil. Grows up to 10 inches tall with a spread of approximately 18 to 30 inches wide in a semi-evergreen mounding habit. An excellent companion perennial plant for the Geranium Biokovo is the Japanese Painted Fern for contrast. Geranium x cantabrigiense 'Biokovo' (Cranesbill)​ - 2015 Perennial Plant of the Year. Orders shipping to west coast states may be partially bare rooted before shipping.